A Green Mushroom: 80 Days... Again! 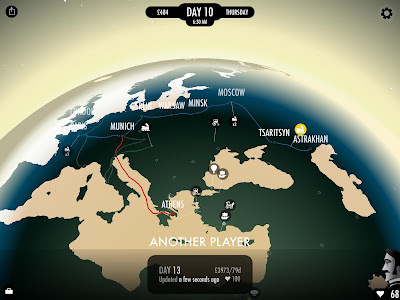 I played 80 Days when it first came out on iOS but a recent update to the game put it in the news again and inspired me to replay it. I still love this game. It's half way between a game and interactive fiction. You are the valet for an English gentleman who has accepted a wager to go around the world in 80 days. He essentially leaves all the decisions to you. You are in charge of picking the route, discovering new routes, handling money, and dealing with key decisions. It starts out as a race out of London but quickly turns into more of an adventure than a race. The first time I finished the game I completed it in 85 days and failed the wager... but it didn't matter, I had a ton of fun. And you always have the option to go around the world again. I heard they had patched in the North Pole, the Moon, and the Center of the Earth since I last played. I set my sights on the North Pole and.... wow. I was amazed with the narrative I got. The Arctic expedition was one of the coolest things I've seen in 80 Days. Without spoiling it... it gets intense, in the most captivating way. By surviving the North Pole I ended up finishing my journey around the world in 56 Days this time! It was so much fun! If you haven't looked at 80 Days you should definitely give it a glance. When I picked it up it was only on iPhones but now it's on all iOS devices, Android, and Steam. Let me know if you check it out. I'd love to hear what other people think about it. Is Disney on the Right Track?